Before the 1800s Cohoes was a farming community along the fertile lowlands where the fingers of the Mohawk River joined the Hudson. The Erie Canal was built 40 feet wide and 4 feet deep to circumnavigate the natural obstacle of the Falls. Concurrently, the innovations that gave birth to the Industrial Revolution were driven by the water power available as the Mohawk River dropped over 90 feet to its confluence with the Hudson River. Cohoes quickly grew into an industrial community around the Erie Canal. In 1825 the route of the Champlain Canal went north along what is now Saratoga Street. The “Junta” with the Erie Canal with the Erie Canal was near the present day intersection of Saratoga and Spring Streets and the Erie Canal and the series of locks that raised water traffic lay closer to the Mohawk and continued more westerly along what is now North Mohawk Street. The City of Cohoes grew up around these canals. While the Cohoes Falls had been a barrier to navigation the difference in elevation provided opportunities for waterpower. The Cohoes Company was formed in 1826 to use this resource for developing industries. The company built dams above the falls, and developed an ingenious system of power canals, designed by Erie Canal engineer Canvass White, by which waterpower was transmitted and sold to Cohoes industries. Opening the route between Albany and Buffalo the Erie Canal was so successful that construction was soon started to enlarge the Canal so it could be used by larger vessels. Cohoes Company swapped land for the new canal for the use of the original canal. 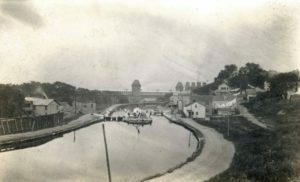 The enlarged Erie Canal was constructed 70 feet wide and 7 feet deep, parallel and upland from the original and opened in 1842. 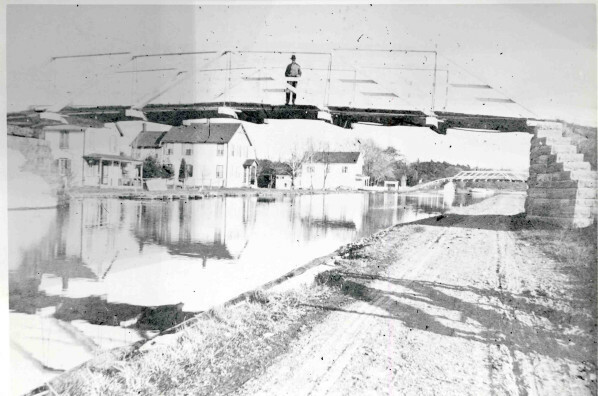 Portions of the original Erie Canal became the Power Canal and were used for foundations of industrial buildings. Locks 37 and 38 of the original canal can be seen through a periscope viewer located at the Clinton’s Ditch Interpretive Plaza on North Mohawk Street. Interpretive signs along the Canal Heritage Trail route starting at the plaza tell more of the story of canals in Cohoes. 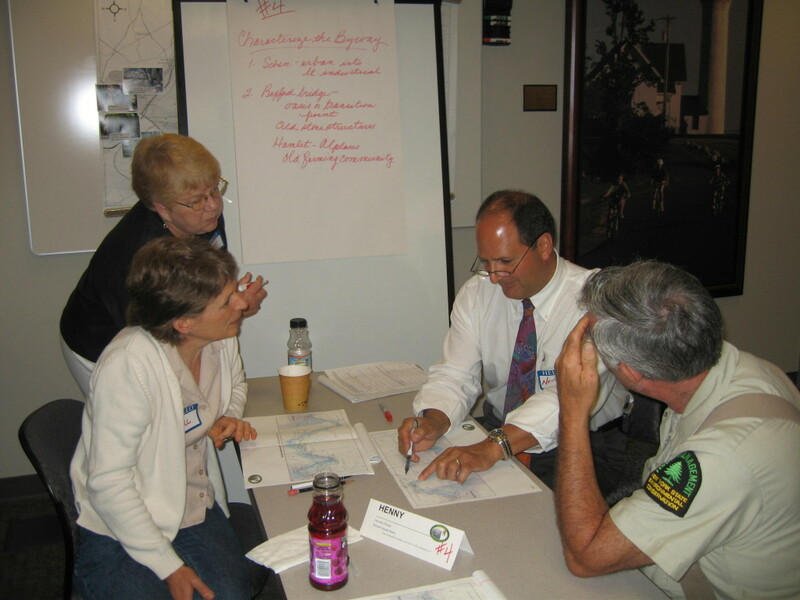 With waterpower and improved transportation provided by the Canals both raw materials and finished products could be moved more efficiently and Cohoes became a prominent center for textile manufacture and other industries. Harmony Mills began operation along the enlarged Erie Canal in 1837, and grew through the 19th century to become one of the largest cotton mills in the world. At its peak, the Harmony Company owned six factory buildings, hundreds of houses for millworkers, and numbers other structures to support mill operations. Many of these buildings can be seen today. Much of the sturdy brick housing constructed for mill workers continues in use as private residences, and several of the Harmony Mills factories (Mills #1, #3, #4 and #6) have been converted into apartments. An overview of the Harmony Mills story can be found on the interpretive signs in Power Park located on Vliet and North Mohawk Streets. I would like to thank Daniele Cherniak from the Spindle City Historical Society for much of the material that went into this post. This material will be summarized on a kiosk panel planned for the parking lot between Lock 18 and Cohoes Falls.